Peter Bryer: Mobile Foresight: Battery stretch. This flexible, stretchable battery technology could enable some wild form factors. Battery stretch. 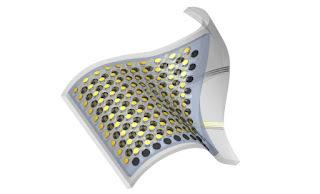 This flexible, stretchable battery technology could enable some wild form factors. Get ready for some more flexibility in design. Samsung, Sony, Corning and other display component vendors have been showing their enablers for flexible smartphone screens for several years. These make for fun demo products at industry trade shows, but won't result in any real-world form factor changes until other components can bend as well. So, here we have a bendable battery. Researchers at Northwestern University in the U.S. are showing a stretchable lithium-ion battery. The battery could be placed inside a device, or inside a human body. It can be charged via inductive coupling which would allow it to be placed in some odd places indeed. Of course these are early days and this is still a laboratory demo. But now is the time for designers to think ahead and stretch their imaginations. The definition of what a device is and where it will be is evolving quickly. Get ready for powerful changes ahead. Will stretchable battery technology enable tinkering outside the box?